Black and glossy wooden rook piece looks so gallant. The Rook chess piece, also known as the Castle, is usually a charger rather than a defender in the game of chess. The picture showed about the strongest of rook and the important of its role in chess game. The rook can move only forward and backward or from side to side and always in a straight line. Each player has two rooks to start a match. By the same taken, a rook best supports of a friendly pawn towards promotion from behind it in the same file. We manufacturer of wooden chess pieces. Our product has made of Teak wood and polished in black glossy color. We also provide in other polish, such as brown, and other color. Our product is the best product because made of the strongest wood in the world, so you do not feel worried to use it outdoors. 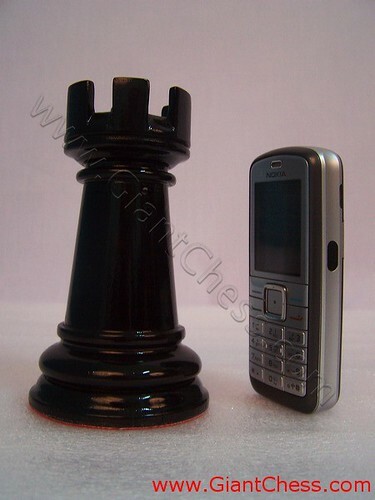 Find the best price on chess piece rook in our shop now!